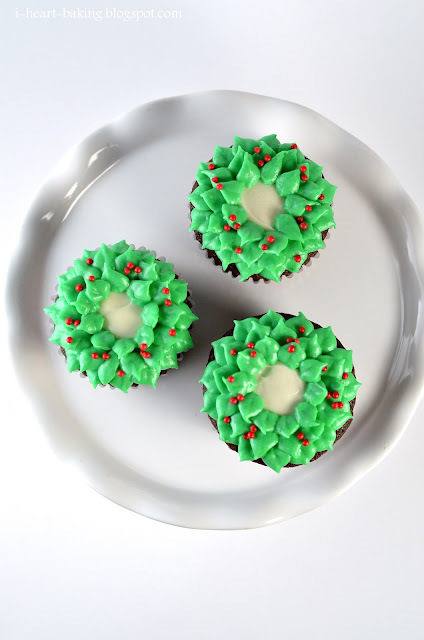 I saw these wreath cupcakes in my Martha Stewart "Cupcakes" book last year, but never had a chance to make them last Christmas. So this year I had to make them! 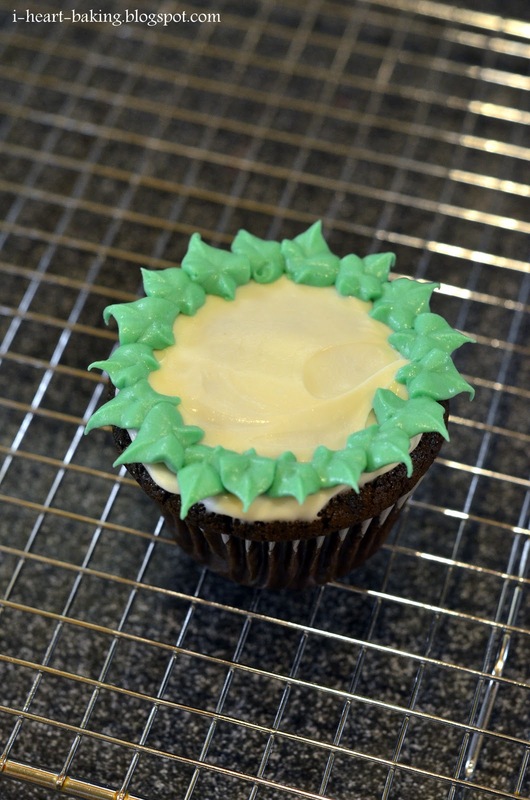 I started by baking chocolate cupcakes, and then whipped up a batch of peppermint cream cheese frosting to top it with (basically a standard cream cheese frosting with about 1/4 - 1/2 teaspoons of peppermint extract added to it). Before adding any coloring, I first used the white frosting to cover the tops of the cupcakes. 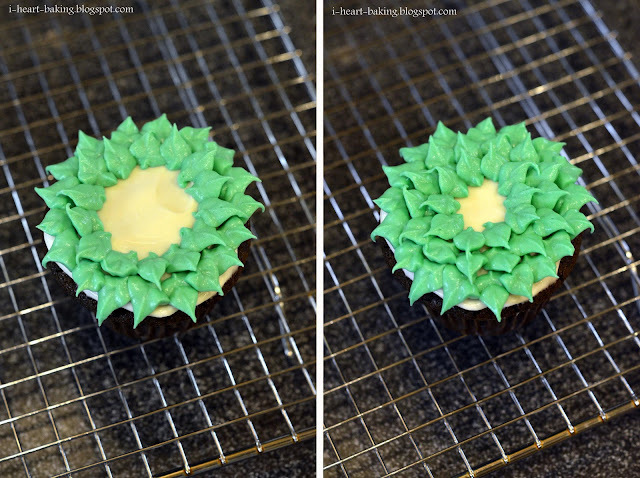 Then I added green coloring to the rest of the frosting, and began piping a ring of leaves on the perimeter of the cupcakes using leaf tip. Then inside the first row of leaves, I piped a second row, and a third row, to finish forming the Christmas wreath. Martha's book suggested using red sugar pearls as the berries on the wreath, but since I didn't have any of those, I used these cute holly and berry sprinkles that I found at Target. I loved the end result. And it had just the right amount of minty-ness and chocolate! Next year I plan on using the same leaf technique to make Christmas tree cupcakes! 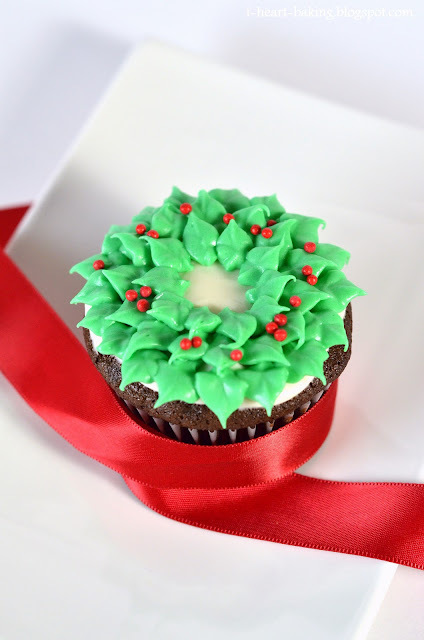 What a lovely cupcakes, perfect for the holidays...!! !